You are at:Home»iPhone»Cellular»My iPhone Says No Service. Here’s The Real Fix! If your iPhone says “No Service”, you can’t make or receive phone calls, send text messages, or connect to the internet unless you’re using Wi-Fi. It’s easy to forget how integral our iPhones have become in our lives — until they don’t work. In this article, I’ll explain why your iPhone says No Service and show you exactly how to fix it. There is no one-size-fits-all solution to this problem, so I’ll walk you step-by-step through the troubleshooting steps I found most effective when I worked at Apple. If you’re on top of a mountain, you may wish to return to society before you continue. If you’re not, let’s stop your iPhone from saying No Service for good. Carriers cancel customers’ accounts for all sorts of reasons. I’ve heard of cases where iPhones were disconnected because the carrier suspected fraudulent activity, the customer’s payment was late, and about disgruntled spouses who really didn’t want to hear from their ex. If any of these reasons resonate with you, give your carrier a call, just to make sure everything’s OK. Your iPhone will say No Service if your account was cancelled, and this is a common, yet easily-overlooked reason for this problem. If you discover the No Service problem is being caused by your carrier, check out my cell phone plan comparison tool to learn how you could save hundreds of dollars a year by switching things up. If it’s not your carrier’s fault (and most of the time this problem isn’t), it’s time to take a look at your iPhone’s software. If you can connect to Wi-Fi, you can check if a software update for your iPhone is available by going to Settings -> General -> Software Update. If an iOS update isn’t available, go to Settings -> General -> About to check for a carrier settings update. There isn’t a button to check for these updates — just stay on the About page for 10 seconds or so, and if nothing pops up, your carrier settings are up to date. If you don’t have access to Wi-Fi, connect your iPhone to your computer and use iTunes to check if a software update is available for your iPhone. 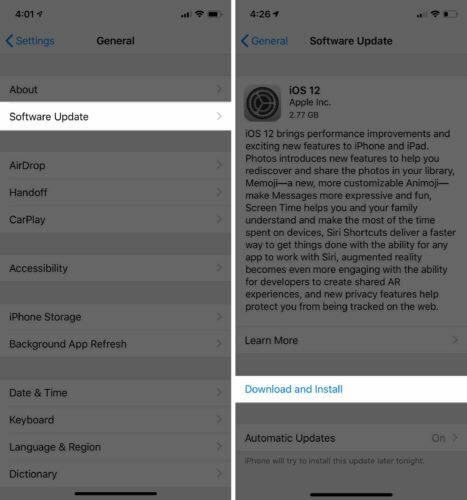 If an update is available, iTunes will automatically ask if you’d like to update your iPhone. iTunes also checks for carrier settings updates automatically, so if it asks, it’s a good idea to update that too. If your iPhone says No Service after you’ve updated your software, or if your software is already up-to-date, it’s time to dive in and do some troubleshooting. 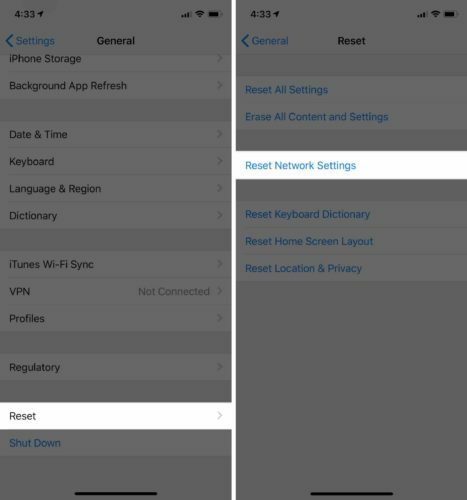 Resetting your iPhone’s network settings to factory defaults can fix all sorts of cellular and Wi-Fi related problems on your iPhone. This “forgets” all your Wi-Fi networks, so you’ll have to reconnect to them and re-enter your Wi-Fi passwords. The No Service problem may disappear after your iPhone reboots. To Reset Network Settings, open Settings -> General -> Reset -> Reset Network Settings. Enter your iPhone passcode, then tap on Reset Network Settings when the confirmation pop-up appears near the bottom of your iPhone’s display. There are a number of cellular data settings on your iPhone, and if something isn’t set up correctly, your iPhone might say No service. Settings can get changed accidentally, and sometimes the problem can be fixed simply by turning a setting off and back on. Go to Settings -> Cellular, and make sure Cellular Data is on. If it is, try turning it off and back on again. Go to Cellular Data Options -> Roaming and make sure Voice Roaming is turned on. Voice Roaming should be on for most people in the United States. Carriers don’t charge for cellular roaming like they used to. If you’re interested, one of our writers wrote an article that explains how voice and data roaming works on your iPhone. A word of warning: It’s a good idea to turn off Voice Roaming when you’re traveling internationally to avoid a massive phone bill when you come home. Go to Settings -> Carriers and turn off automatic carrier selection. 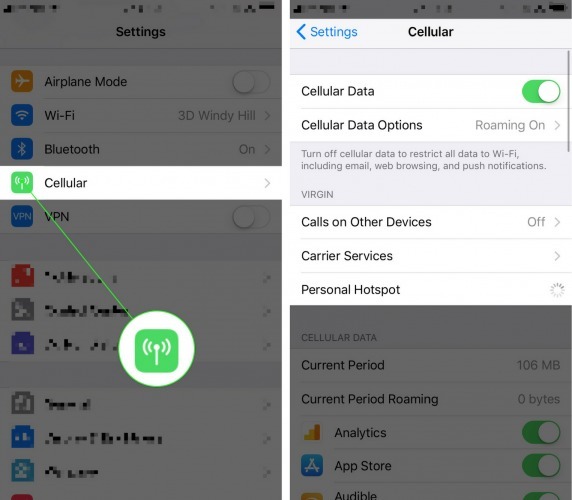 Your iPhone may stop saying No Service if you manually choose which cellular network to connect to. A lot of readers will not see this option on their iPhones, and that’s perfectly normal. It only applies to certain carriers. Your iPhone’s SIM card links your iPhone to your carrier’s cellular network. It’s how your carrier distinguishes your iPhone from all the others. Sometimes, your iPhone will stop saying No Service simply by removing your SIM card from your iPhone and putting it back in again. If you’re not sure how to remove your SIM card, read steps 1-3 of my article about why iPhones sometimes say “No SIM.” To remove your SIM card, you can pick up a SIM card ejector tool on Amazon — or just use a paper clip. If your iPhone says No Service after you read my other article, come back here and move on to the next step. It’s easy to understand why an iPhone might say “No Service” if it’s smashed, but water damage can be invisible and insidious. If your iPhone started to say “No Service” after it got wet, there’s a good chance that water damage is causing the problem. Apple doesn’t repair water-damaged iPhones — they replace them. If you have AppleCare+, the cost of replacing a damaged iPhone is negligible compared to what it costs if you don’t. If you’re looking for a less-expensive alternative, visit the Repair Options section below. 7. Back Up And Restore Your iPhone, But Read The Warning First! Software corruption can cause everything from excessive battery drain to iPhones getting too hot to problems like this one. Make sure you back up your iPhone to iTunes or iCloud if you choose to continue, because restoring your iPhone erases everything on it. Restoring your iPhone when it can’t connect to a cellular network is very dangerous, for this reason: An iPhone has to be activated before it can be used after a restore. If you restore your iPhone and it still says No Service, it will be totally unusable. You won’t be able to do anything: not restore your iPhone, not use your apps; nothing. If you have a backup phone available and you’re willing to take the risk, restoring your iPhone can resolve this issue, but there are no guarantees. I don’t recommend you try to restore your iPhone unless you have an Apple Store nearby. Sometimes carriers have special activation codes that can resolve the problem when your iPhone says No Service. These codes change too frequently and there are too many carriers to list specific codes here, but there’s a chance your carrier may be able to help you over the phone. If that doesn’t work, your carrier will send you to an Apple Store to have your iPhone diagnosed by a technician. If you choose to go to an Apple Store, it’s a really good idea to call ahead or go online to make an appointment at the Genius Bar before you arrive. You could end up standing around for a while (or buying a new Mac) if you don’t. If you’d like to save some money, Puls will meet you at a location of your choice, fix your phone today, and guarantee their work for life. One of the biggest side effects when your iPhone says No Service is that its battery begins to die very quickly. If that’s happening to you (or if you’d like to get better battery life in general), my article about how to save iPhone battery life can make a world of difference. 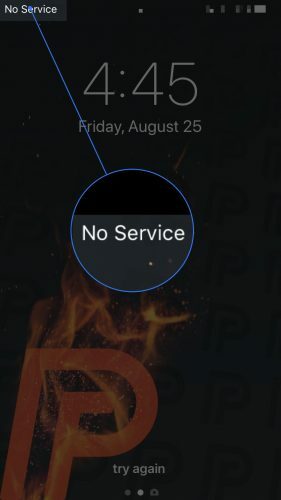 If this isn’t the first time you’ve run into the No Service issue and you’re fed up, check out UpPhone’s carrier coverage maps or use my cell phone plan comparison tool to learn how much money your family could save by switching to another carrier. 20 years ago, a complaint about our inability to make phone calls from wherever we are might be seen as a “luxury problem”, but things have changed, and our ability to stay connected is vitally important to our daily lives. 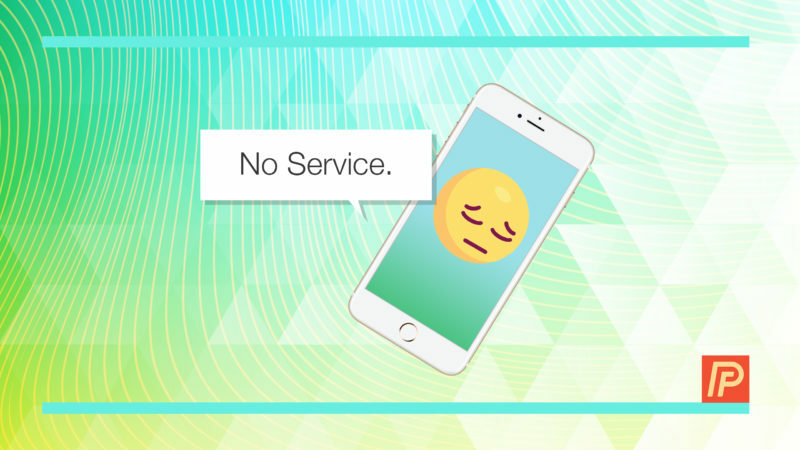 In this article, you learned why your iPhone says No Service and exactly how to fix it. I’m interested to hear which fix solved the No Service problem for you in the comments section below. Previous ArticleWhy Does My iPhone Say Searching? Here’s The Fix! Next Article My iPhone Screen Is Black! Here’s The Real Reason Why.